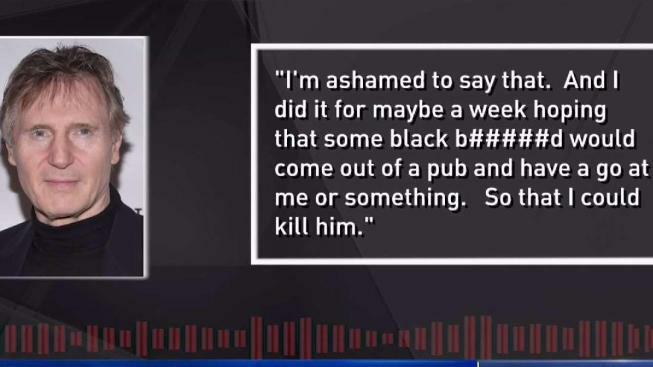 Neeson says that after being told the attacker was black, he "went up and down areas with a cosh (stick or truncheon)" hoping a black person "would come out of a pub and have a go at me about something, you know? So that I could kill him"
Actor Liam Neeson's comments in an interview are being criticized by many as racist. Chris Glorioso reports. Liam Neeson has said he is ashamed to admit he had violent thoughts about killing a black person after learning that someone close to him had been raped. Many social media users expressed shock at his admission, accusing the "Taken" star of racism.